Perfect Finish have been nominated as one of the bodyshops of the year at the British Bodyshop Awards. This is down from a shortlist of not 200 bodyshops, not even 300, but out of 400-500 bodyshops in the UK. An incredible accolade I’m sure you’ll agree. Perfect Finish are competing against 5 other bodyshops in their category, but as they came runners up last year, and have improved tremendously since then, Perfect Finish have every chance of winning. What makes the shortlist even more special is that the finalists weren’t chosen by judges, they were all from customer reviews. Every client who used Perfect Finish were asked to complete a questionnaire. They were asked questions like how quick was the service you received, how happy were you with the service you received, etc. They filled in points between 1 and 10 and then all the totals were added up to make a grand total. Michelle and Tony Berry from Perfect Finish will be going down to the Battersea Evolution in London on Tuesday 14th May to see if they’ve scooped the accolade. Top insurance companies, car manufacturers and accident management companies will be on hand to present the awards to the winning bodyshops. Other categories at the event include Best Customer Service and Excellence in Training Award. We’ll be crossing our fingers for them on the night. And of course, we will let you know how they get on. It isn’t the only price Perfect Finish have received recently. They were given an award with one of their work providers and were in the top tier of repairers. 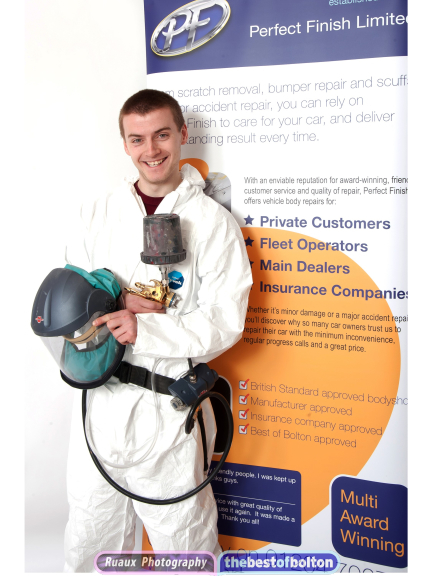 They were in the top 10 bodyshops in the whole of the country. As they are members of thebestof bolton, we already knew how great Perfect Finish were, but now audiences nationwide have realised this too, so a massive congratulations to them. Contact Perfect Finish on 01204 689934 and discover why they are winning so many awards.